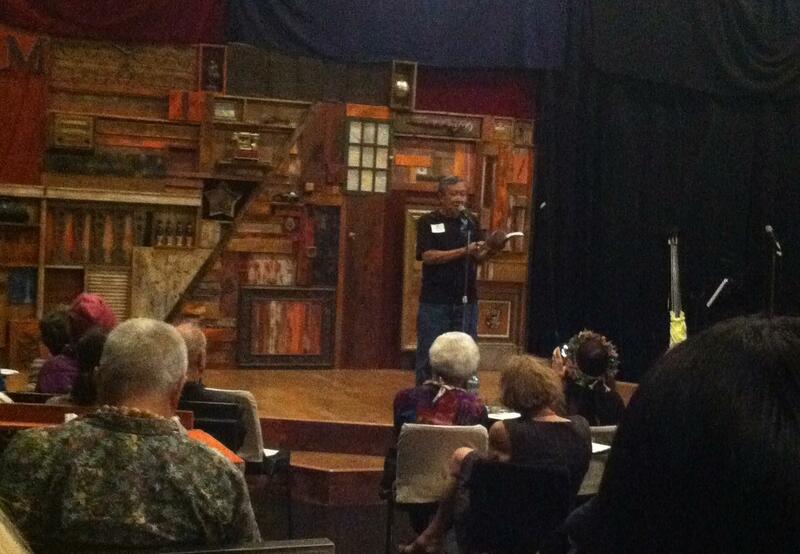 Darrell Lum reading a new poem at the recent Bamboo Ridge Wine and Words. 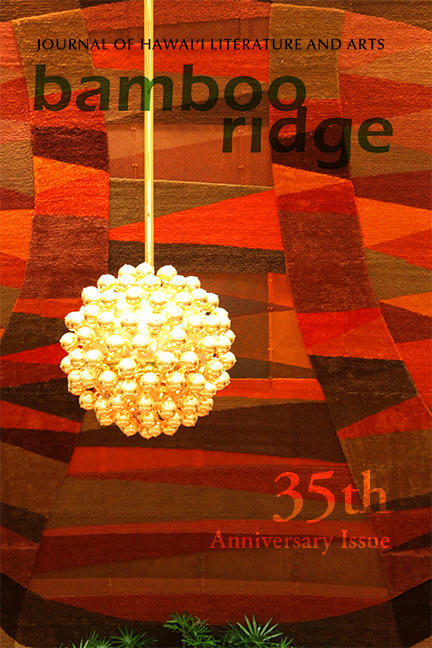 The latest Bamboo Ridge collection, the 35th Anniversary Edition featuring artwork by weaver, Ruthadell Anderson. A fond farewell to Eric Chock and Darrell Lum as they leave their posts as co-editors of Bamboo Ridge Press. They will probably be writing more now. Bamboo Ridge Press was founded in 1978 to publish local literature. Like a fishing float, it has bobbed through controversies about pidgin, literature, localness, and kept publishing---somehow Darrell Lum, Eric Chock and a loyal band of writers have kept it going. Someday, however, everyone knew things would change, and HPR’s Noe Tanigawa reports, after 36 years, Bamboo Ridge’s founding editors are passing the torch. Guest editors Lisa Lynn Kanae and Lee Cataluna participated in editing the 35th anniversary issue, available now. Kanae and Gail Harada will edit the next collection. Brenda Kwon launches her new book, "The Sum of Breathing," Saturday, December 6, 4pm at Manifest. Here's the Bamboo Ridge website. Check here for tips from Babmoo Ridge writers about getting started, getting better, and getting published. On this page you will find Eric Chock's poem, Squid Eye. He read it at the recent Wine and Words gathering, saying it is about standards---I think you'll like it. Darrell Lum read a new poem he wrote for an NPR program, I hope he submits it to a future Bamboo Ridge issue! Participate in the monthly Bamboo Shoots writing series. In an effort to get local literature into our schools, Bamboo Ridge Press, in partnership with the Hawaii Council for the Humanities, has initiated a program that will enable middle/high schools to order deeply discounted books with subsidies that will reduce the cost further. A FREE workshop and reading are included!